According to the World Health Organisation, Russia is still in the category of "countries not yet hit" by the swine flu pandemic. 187 confirmed cases of the infection is not many, especially considering the hundreds of thousands of Russians who take summer holidays abroad (it was after returning from foreign countries that all those infected fell ill). Most have already recovered and been discharged from hospital. In Russia, it is the practice to hospitalise swine flu sufferers, because doctors do not trust home treatment: patients who stay at home have to buy their own costly medicines, and it's difficult to check if they have bought the medicines and are shaking off the illness. In hospital, however, patients get free treatment. At the slightest suspicion of flu, people are sent to hospital and everyone they've been in contact with is followed up. According to Russia's Federal Agency for Health and Consumer Rights, almost 10,000 flights and about 800,000 passengers have been checked since April 30, when monitoring began. The most serious case was in July in Yekaterinburg: 14 of 24 children returning from a language school in the UK ended up in hospital with flu symptoms. The reaction of Gennady Onishchenko, Russia's chief medical officer, was immediate: he banned organised groups of children from going to the UK. This was followed by a similar temporary banning order from Nikolay Filatov, chief medical officer for Moscow, which surprised travel companies. They were supported by lawyers in denouncing the move, including State Duma deputy Pavel Krasheninnikov, who said a medical officer does not have the right to close the border. However, the Federal Agency for Health and Consumer Rights quotes the 1999 law on epidemiological protection of the population, which prescribes quarantine if it is recommended by the public health service. It's not clear why children's trips have been banned, when they can still travel abroad individually. Parents also have the problem of having paid for trips which will not be reimbursed, as cancellation wasn't the fault of the travel companies. In theory, the trip can still take place, but only if the travel company takes responsibility for the children's health. If the children fall ill after the trip, the travel company will at best have to pay a fine, and at worst lose its licence for three months, said Irina Tyurina, press officer for the Russian Travel Industry Association. The tourism industry is not prepared to take that risk. Russian football supporters could be next to be grounded. Onishchenko has said they shouldn't go to Cardiff for the Wales-Russia match on September 9, saying the trip was "extremely unnecessary and inappropriate during a flu epidemic". The Russian Football Association's press officer, Andrei Malosolov, said that while, of course, people should listen to the medical official's advice, the Russian team should not be left without support. Such measures could be seen as an overreaction, but most experts are convinced that the actions of the medical authorities helped Russia avoid an outbreak of swine flu. Moreover, Onishchenko keeps reminding people it's too early to relax: autumn is on its way, with its traditional surge in respiratory illnesses. According to him, a swine flu epidemic could start in Russia as early as September, when the majority of Russians return from their holidays and children go back to school. Experts forecast that, in the worst circumstances, Russia could see up to 30pc of the population falling ill. In order to prevent this, medical services are planning a mass vaccination - about 40m doses will be used. 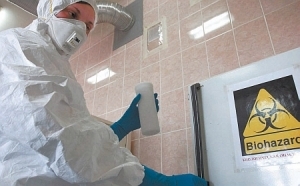 Scientists have said that a Russian vaccine against the H1N1 virus will be ready by October 1.